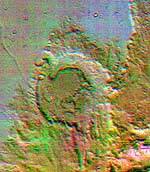 Water-ice has been found in vast quantities just below the surface across great swathes of the planet Mars. The finding by the American space agency Nasa is undoubtedly one of the most important made about the Red Planet. It solves one of its deepest mysteries, points the way for manned exploration and reignites the question of whether life may exist on Mars. Insiders suggest that partly as a result of this finding, Nasa may commit itself to a manned landing within 20 years. The US space agency will make the dramatic announcement next Thursday just prior to a full disclosure of the findings in a major scientific journal. The discovery was made by the Mars Odyssey spacecraft, which has been gathering data since late last year. It confirms early observations that pointed to enormous reservoirs of ice. This finding will answer a question that has puzzled Mars researchers for decades: Many lines of evidence suggest that the Red Planet was water-rich in the past, so where did all that water go? 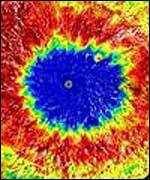 The answer appears to be that it is in the regolith - the layer of loose rock and dust on the surface. 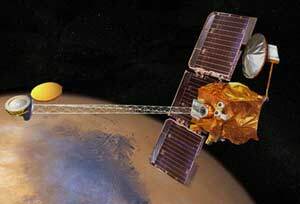 Mars Odyssey has been returning high-quality data about Mars' surface composition. The same design of instrument was used on the Lunar Prospector spacecraft that discovered ice in the shadowed regions of the Moon's poles in 1998. Also onboard Mars Odyssey is a neutron spectrometer that registers evidence for underground ice in the same regions of the planet. Researchers were amazed at the strength of the signal of the ice. They had expected to take a year to gather enough evidence but managed to do so in just a few weeks. They announced preliminary findings in March but now have good data confirming large amounts of the water-ice beneath the surface. The ice is just beneath the surface south of 60 degrees latitude. Researchers suspect the same to be true of the northern hemisphere but cannot make the appropriate observations until later this year due to the Martian winter in the north. They were scheduled to hold a major news conference on Thursday when they would say that their earlier findings had been confirmed and extended. But that may be brought forward after a British newspaper leaked the news. The dramatic discovery may also guide the selection of future landing and exploration sites on Mars, and may suggest areas to look for evidence of past life. Although landing probes are planned - the European Beagle 2 and Nasa's twin Mars rovers next year - neither are targeted at the region where the ice may exist. The Mars Polar Lander was to touch down in exactly the right spot in 1999 and would have undoubtedly detected the ice had it not malfunctioned on the way down. Having water just below the surface will be an enormous boon to astronauts on Mars. Water is essential for life, so the discovery enhances the belief that Mars could have had life in the past and perhaps in the present as well. Because of that, bringing a sample of the ice and rock back to Earth by an unmanned sample return probe is becoming a top priority. R U taking UR insulin?